The dark nights are looming in and the temperature is starting to drop. It might be tempting to keep your central heating switched on 24/7 – but will come with a nasty shock when it comes to paying your gas bill. Keep costs low and the temperature in your home high this winter with these handy, cost-effective tips. Are you fed up of manually fiddling with your thermostat every time you leave the house or you come back home? A programmable thermostat will help to keep your bills low and your efficiency high. At SP Taylor we supply a range of Honeywell wireless thermostats which have optional features called Optimisation, which aims to save energy while making you as comfortable as possible. A Honeywell wireless digital room thermostat can work out what time to come on to suit you, and will save energy and money by switching off before the normal programme time whenever possible. To find out more about Honeywell thermostats, call us on 01922 474313. As warm air in your home rises, cold air from outside is drawn into the house and reduces humidity which will leave you feeling cold. Investing in a draught excluder is a cheap way to retain heat in your home, as most homes lose around 20% of generated heat as a result of draughts and poor ventilation. Windows that don’t shut properly are also a key culprit, but can be easily draught-proofed with self-adhesive foam strips from your local DIY shop. Don’t forget draughts from keyholes and your letterbox too. Swapping cotton sheets for flannel sheets is a simple yet effective way to keep warm in bed, as the fabric retains heat for long time periods by trapping body heat and preventing the cold from seeping in. Make sure that every room in your house is getting its maximum heat potential, by finding a way to move furniture away from radiators and other heating vents. If any furniture is blocking a radiator, you are wasting money by heating something that doesn’t need heating. Re-arranging your furniture will ensure that you feel the full effect of your heating. Capture as much sun as possible as even on cold days, the sun is still warm. So before you leave the house for the day, open up those curtains and let the light shine in. Once the sun goes down, you want to keep all of that heat from leaving through the windows by closing the curtains. If you’re in a particularly cold home or geographic area, consider investing in insulated curtains as they will prevent some of the warmth in your home from escaping and reduce heat loss by up to 25%. According to the National Energy Foundation, uninsulated wood floors can account for up to 10% of a home’s heat loss. Area rugs aren’t just a way to add colour and style to any room – they were invented to keep your floors cosy. Add a rug or a roll of carpet to your floor during the winter, as they will keep cool air from seeping up into the room and your toes will definitely thank you. Wasted heat equals wasted money – but it’s something that a little DIY can’t fix. Putting tin foil behind the radiators in your home reflects heat back into the room, rather than allowing it to escape through the walls. You can purchase specially designed foil for this purpose from your local DIY shop. Loft insulation and wall insulation could save you a substantial amount on your energy bills as it will trap heat, and isn’t particularly expensive either. Hot water pipes also work more efficiently when they are insulated, and will save you money on your heating bills and will mean that you won’t need to wait as long in the mornings for your water to heat up. All of the above tips are useful, providing your boiler and central heating are in correct working order. 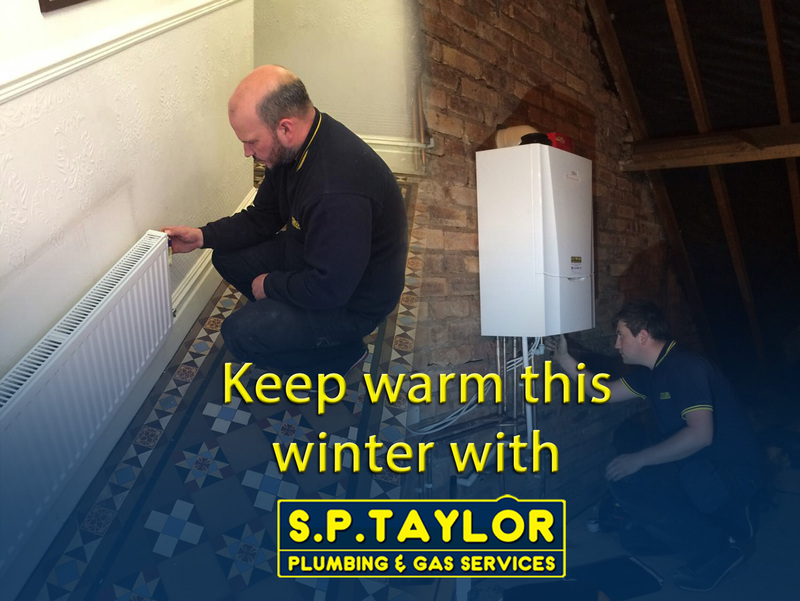 Here at SP Taylor we provide a range of services that will ensure your home is warm this winter, including boiler service and fire service. Give us a call on 01922 474313 and we will be happy to help you will all of your gas and plumbing needs to ensure that you’re warm this winter.